Want to solve the world’s problems and do it economically? Stock up on pool noodles. Maybe you won’t solve all the problems but you will feel virtuous for saving so much money. And clever. You’ll feel clever! This list of pool noodle hacks will get you started. Some of the ideas are especially for kids: a racquet ball game, water wall, nunchucks, kicking croquet, glowing ninja stars and water blasters. Party ideas include floating luminaries, napkin rings and postal popsicles. There’s also a wreath, an idea to fill garden pots, a door stop, a beverage boat. And don’t miss the column—it is amazing! Plan a summer full of exciting things with this Free Printable: Summer Bucket List. Gear up for every adventure summer throws out at you with Must-Have Summer Gear for Kids. Check out these fun balloon games before heading outdoors too. Don’t miss these Beach Hacks — so many great and clever ideas! Here is a quick and easy safety tip that can be done on a budget. Replace your worn-out trampoline safety pad with pool noodles! It looks really cool and I love how the bright colors pop, making the trampoline look so bright and cheerful. You can get all of the pool noodles you need from the dollar store for under ten dollars, and then all you have to do is use a box cutter to make slits down the middle of the pool noodles and wrap them around the springs. Mail a popsicle to your pals this summer! No refrigeration necessary with these easy popsicle postcards made from foam pool noodles, cardboard, and wooden craft sticks. All of the supplies needed are easy to find and it is a super easy craft to put together. Just add some stamps and these summertime treats will be sure to deliver a smile to anyone’s mailbox. Use your pool noodles to create a clever and inexpensive new game. Fold the ends of the noodles together and wrap a netting then secure the ends with a colorful heavy duty tape and secure in place. Grab a ball and use your new paddles to play racquet ball, tennis, or just hit around. You can create a new game or play a classic. Plus, your new racquets can be taken into the pool to continue the fun. 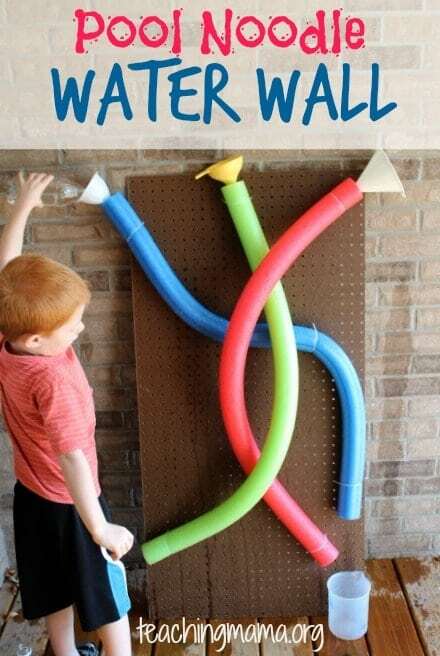 Create this fun interactive water wall using pool noodles, a few house hold items and a few other items you can pick up at the store. Attach a few colored noodles to a peg board, top with funnels and place buckets or containers at the bottome. Pour water in the tops and see which bucket fills up the fastest. Make a game of it and see who wins! Kids spend a lot of the summer in the water. Whether it’s pool time or tub time, they will love playing with a sailboat they have made themselves! This sailboat craft is a great project for kids and is made to be totally waterproof for water play. The hull of the boat is made from a slice of foam pool noodle so it floats, and the sales are made from two triangles of craft foam. Decorate your boats to look like pirate ships, race boats, or anything else you can imagine. Help your kids burn off some energy and learn to stay cool during rough play with these fun and safe foam nun chucks made from pool noodles. They are the perfect close-combat weapon for your kids to arm themselves with during Nerf Gun battles! All of the pieces and parts needed to recreate them are really cheap and easy to find, a couple dollars at most for anything you don’t already have in your house. Kids need to burn off some of that extra energy? Have some old pool noodles lying around the garage or shed? Then it is time to make up your own kick croquet lawn game! Cut pool noodles in half down the middle and use each half to make two arches. Garden stakes are an easy way to hold them in place on the lawn. Gather up a few kick balls and kick the ball through the course croquet style. First one to get their ball to the finish wins. Pool noodles seem to be the newest, fun, educational supply item. Hop on that bandwagon and try your hand at this awesome pool noodle project. Your kids can use this DIY project to practice spelling sight words, word wall words, and more. Use as many different colors for the words as you can to help separate the letters of one word from another or mix them all up to help your kids practice letter recognition. Create a simple, but fun, sprinkler by pocking a few holes around the base of the pool noodle. Plug the bottom hole with extra foam from a noodle and heavy duty duct tape. Place the water hose in the other end of the noodle and hang up. Turn the water on and enjoy your DIY sprinkler that you made for just a few dollars. Hot summer weather is rapidly approaching. Beat the heat with some water fun by making this water blaster sprinkler that blasts and shoots water all over the backyard! The pool noodles can shoot water over thirty feet, giving your boys endless fun for the whole summer. Once you have all your supplies you could have this built and be playing in under an hour. Clear out all of the pool noodles from your local dollar store this summer so that you can make pool noodle chains with your kids all year long. Small slices of foam pool noodles can provide hours of fun, plus a chance to practice patterning and counting with your kids! Link the pieces of pool noodle together and see how long you can make your pool noodle chain. yourself or with your kids’ help. My boots never fit in the closet, so I always have to resort to storing them on the closet floor. The only problem is that when your store boots like that, they always slump over and get super messy. For an easy, budget-friendly storage solution fill your boots with pieces of pool noodle! This genius boot storage hack will save your boots and your wallet. If you are planting flowers in a large flower pot, it can get super pricey to fill it all with soil. Provide some drainage for the plant while saving some money by adding pieces of pool noodles instead of pot filler. All you need to do is take scraps of pool noodle or cut pieces of pool noodles from the dollar store, and place them in your pots and planters. Fill the rest of the space with dirt and plant your flowers as usual! Having a cooler full of drinks is a total necessity when you are hanging out by the pool. You can find floaty drink holders in pool stores, but they can get super pricey and only hold four drinks. With this tutorial, you can a floating cooler to hold all of the drinks you desire right in the pool! Four pieces of pool noodle transform an ordinary plastic bin into the floating drink cooler of your dreams. These pool noodle luminaries are little pieces of floating foam heaven that can be used for just about anything. Who knew that such a simple project could make such a big splash? Use bright and summery colored pool noodles and LED tea lights to easily recreate them for your pool or pond. It would be so much fun to throw a bunch in the pool for a backyard night swim with the kids! No more slammed doors! I don’t know who came up with the idea to make door stoppers out of pool noodles, but they definitely deserve some kind of award. Sawed off pieces of pool noodle with slices down the centre fit perfectly over the edge of a door, and stop them from hitting the wall on the other side. Pool noodles are a great solution for slamming doors when there are kids in the house. You really can use pool noodles for anything! This brilliant blogger created a wreath form using slices of pool noodles for a fun and thrifty craft. She wrapped denim fabric around the form and decorated with homemade fabric flowers and ribbon. Following the same tutorial, you could make a wreath for nearly any occasion. You would never believe that these decorative stone columns were made from pool noodles. Wrap some dollar store pool noodles around a concrete form tube, then use contact cement, some scrap wood, and spare paint to create a beautiful column perfect for resting a plant on. The end result is incredibly sturdy and inexpensive. The whole project should cost around fifty bucks! Fancy up poolside meals or picnics with this hack. Around the summertime, you can find pool noodles of all different shapes and colors at your local dollar store. Flower shaped pool noodles make the perfect craft material for tons of different projects. Thin slices make beautiful flower shapes that are perfect for napkin rings. They are reusable, last forever, and add a fun pop of color to any outdoor party.